The season of Cory Monteith tributes has officially begun. Two weeks after Lea Michele broke her silence about the death of her Glee co-star and boyfriend Cory Monteith — thanking fans for their support on Twitter — the Glee actress has spoken to her fans for the first time since Monteith passed away in July following a heroin and alcohol overdose. 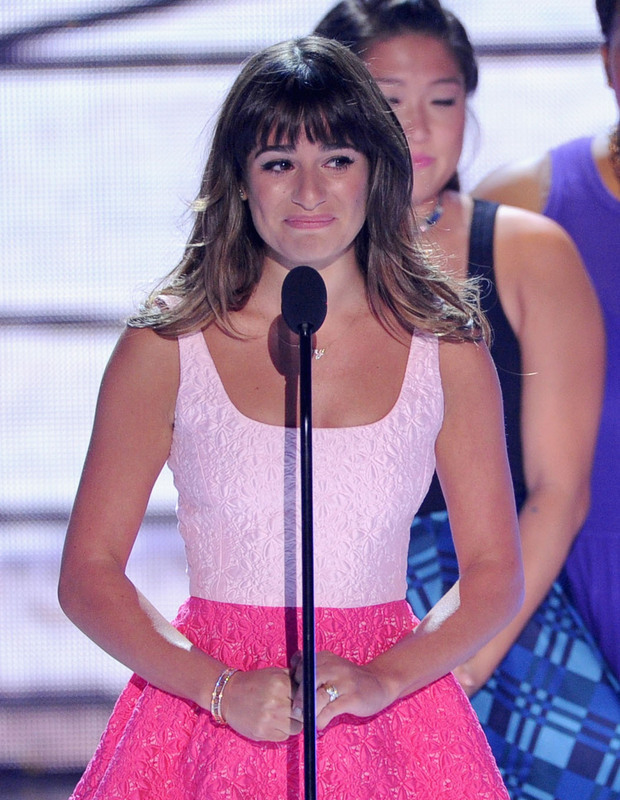 Picking up the win for Choice TV Actress at the Teen Choice Awards Sunday, Michele took the stage and tearfully paid tribute to the actor also known to many fans as Finn Hudson. Said Michele, "I just wanted to be here today to personally thank all of you and tell everyone out there how much all of your love and support has meant to me over these past very difficult few weeks. Not that I had any doubt before, but you guys are most certainly the greatest fans in the world." Michele continued, "And I wanted to dedicate this award to Cory for all of you out there who loved and admired Cory as much as I did, I promise that with your love, we're going to get through this together. He was very special to me, and also to the world, and we were very lucky to witness his incredible talent, his handsome smile, and his beautiful beautiful heart. So whether you knew him personally or just as Finn Hudson, Cory reached out and he became a part of all of our hearts. And that's where he'll stay forever." Michele was joined on stage by some of her Glee cast members, who looked on as Michele thanked fans and watched an in memoriam screen at the Teen Choice Awards honor Monteith. It's no surprise that Michele's Glee co-stars are lending a shoulder — filming for Season 5, which will feature a tribute episode dedicated to Monteith, resumed just last week.